Warrigal Greens (Tetragonia tetragonioides) are also known as Botany Bay Spinach or Sea Spinach, and grow wild along the coast of Australia, New Zealand, Chile, Japan and Argentina. 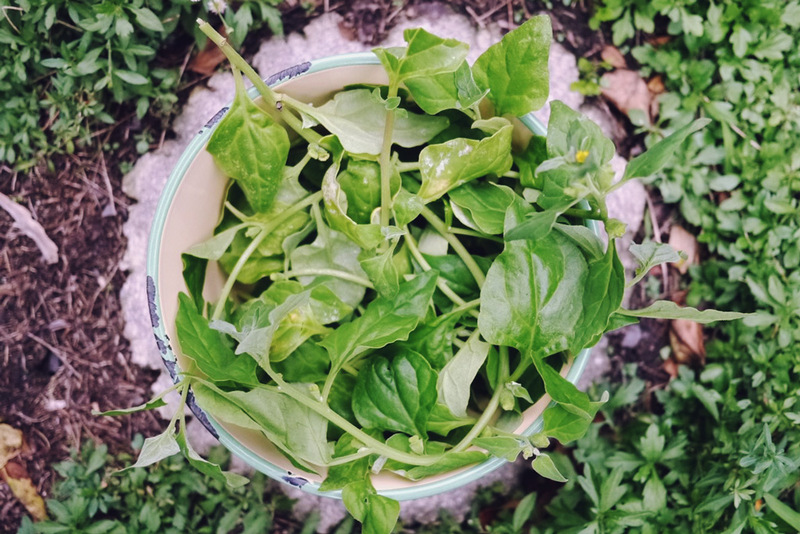 If you’re in these parts, you can find it where the sand meets the soil, or you can cultivate it too – it’s a hardy and delicious addition to any garden. 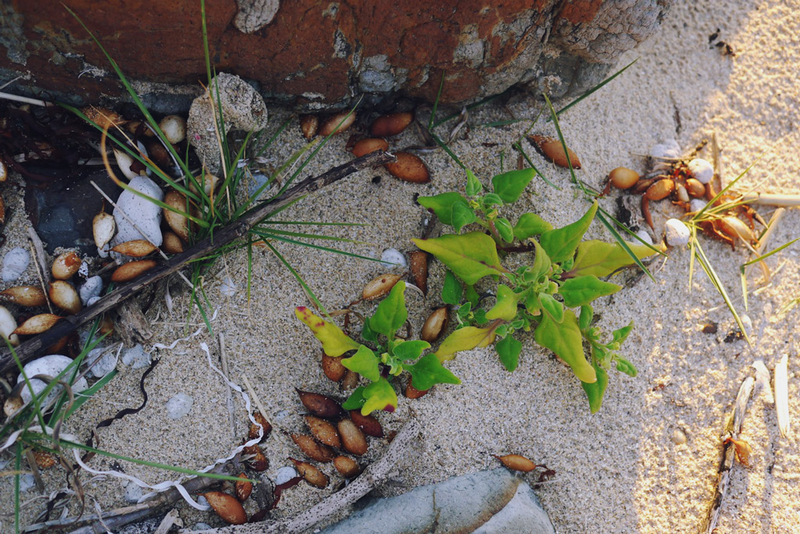 The habitat above the shoreline of beaches and estuaries – where the sand meets the soil – is a rather magical place. On one one side there’s the beach, and on the other side there’s the soil-based land, and in between, there’s this liminal space where pioneer species like Warrigal Greens help convert the foredunes resources (like decomposing seaweed and other available biomass) into the beginnings of soil. Since soil is that rather important stuff on which all terrestrial life depends, I see this kind of community as rather special. 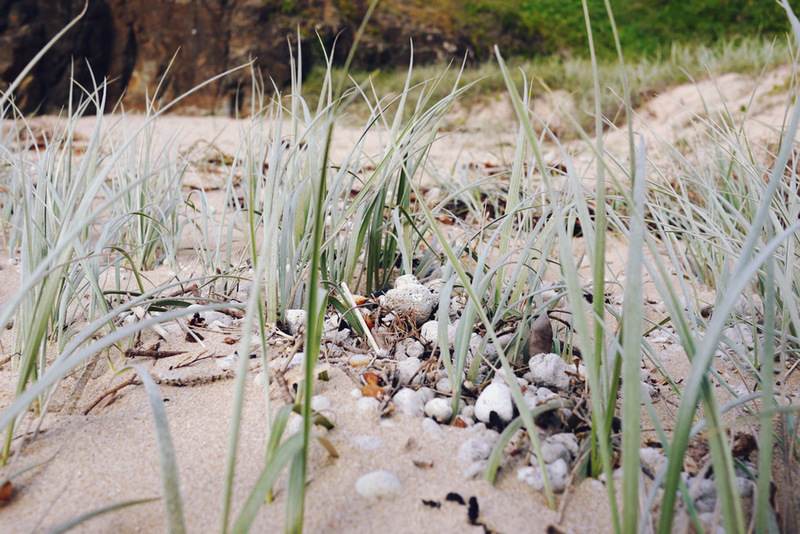 Look for Warrigal Greens under trees that are on the edge of the sand-meets-soil habitat, or where there is a large amount of decomposing seaweed at the storm-tide (higher than the high tide) mark along dunes and estuaries – this is where you’ll find this tasty wild green. On the South Coast of Australia, the first place I always look is under melalucas and norfolk pines – these are my go-to species for finding warrigal greens. 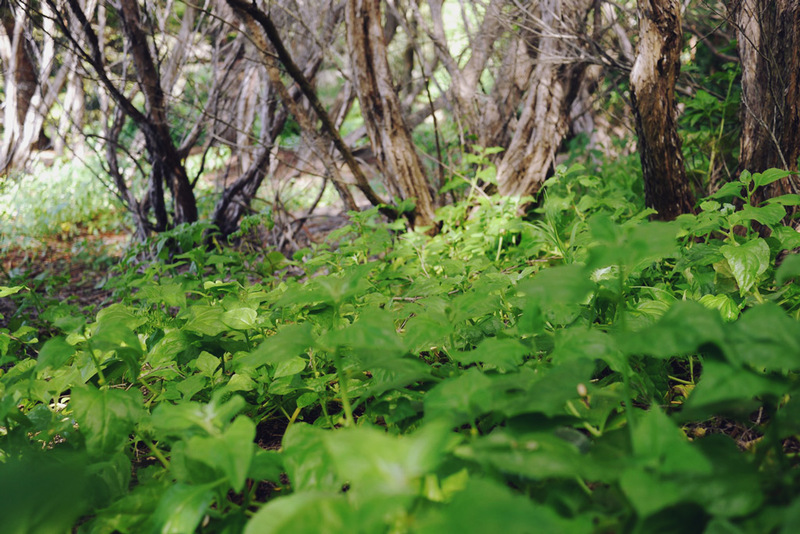 Warrigal Greens generally grow in a sprawling mat, or in small pockets here and there. Get to know the leaf shape and plant habits to ensure you pick the right stuff. 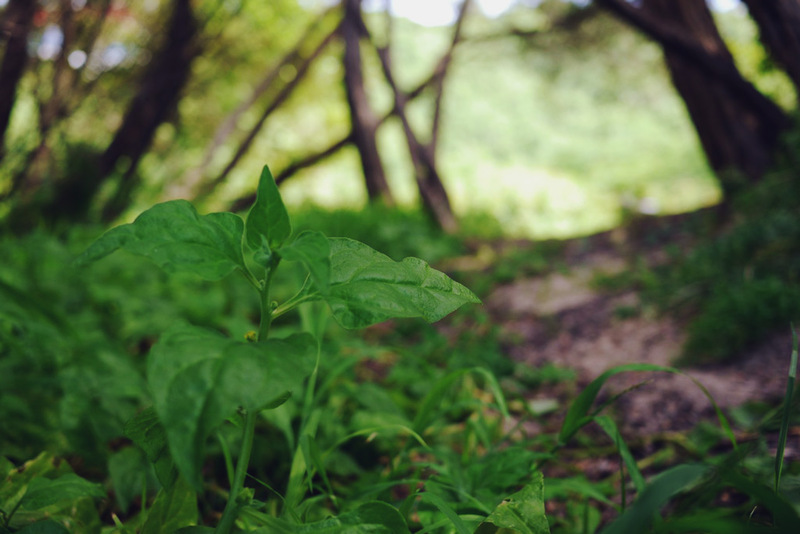 A little further inland, you can often find Warrigal Greens pioneering over degraded ground. 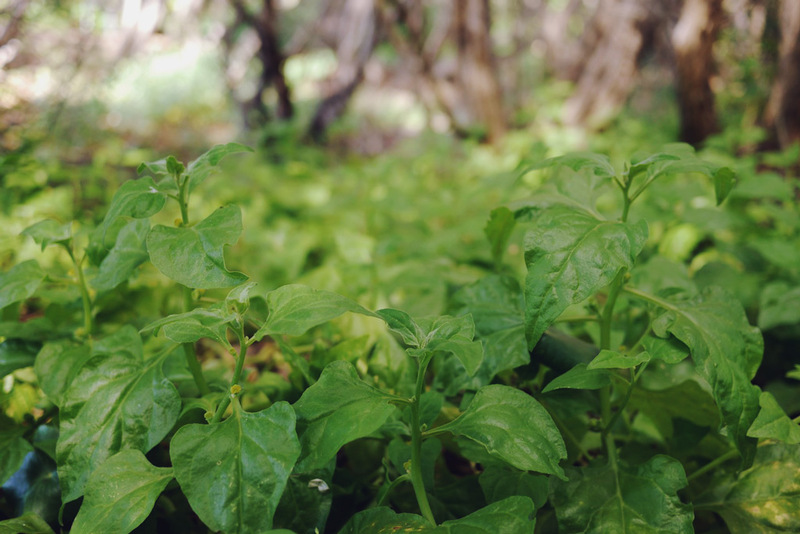 Warrigal Greens reach their peak in the hotter months, but in maritime environments you can find them under trees year round. Consider it an annual in colder parts, and a short-lived perennial in warmer areas. *Note: harvesting any plants in nature reserves and natural parks in illegal, so go find somewhere where it’s ok to do so. Take what you need for today, and no more. 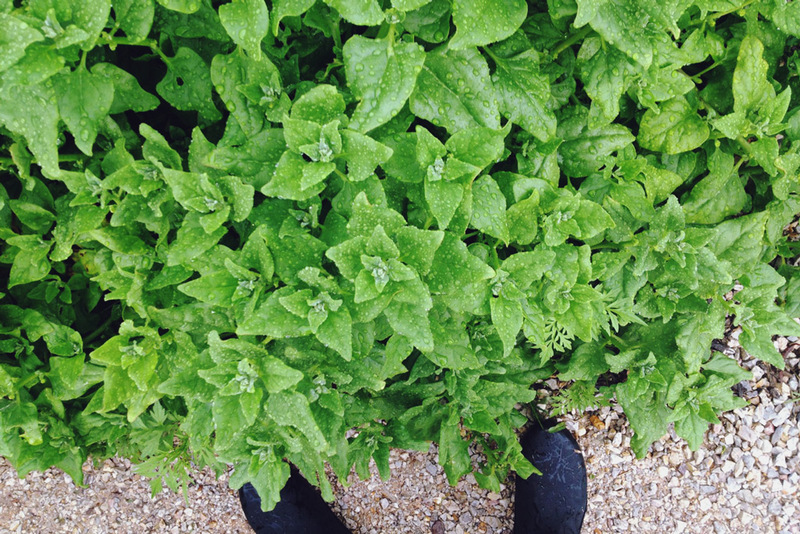 Also, do you best not to step on the plants. As mentioned above, these plants are doing a very important job making soil and generally holding things together, so don’t mess them up or take so much that they cannot do what they’re there to do. Warrigal Greens grow well from cuttings and/or planting seeds in pots and planting out. Once you plant them out keep them watered, but don’t feed them anything special. Like most garden plants, they love sun and good soil (but can put up with far-less-than-great soil too). At our farm in Mudgee, we planted seeds in one of the woolshed garden beds and one small plant grew, which then sat there for a season, didn’t do much, and died off in the frost. 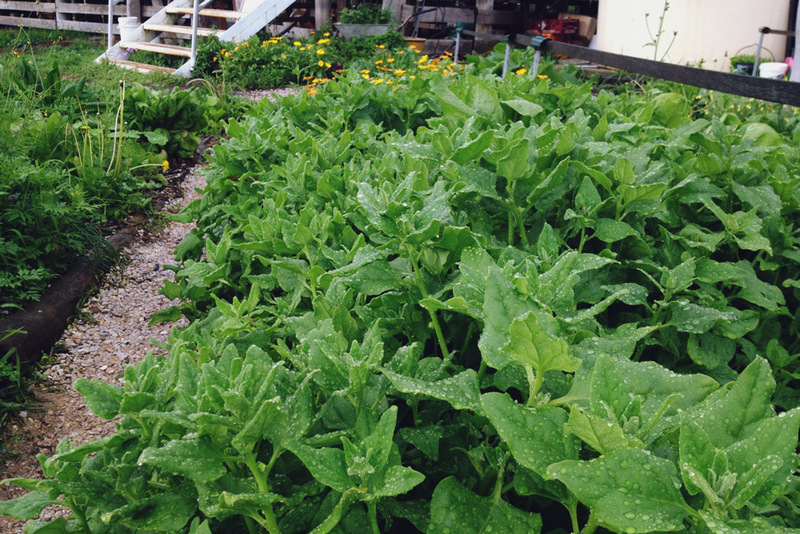 The next year however, without planting any more, the Warrigal Greens went nuts in the same garden bed. Not that this helps much, but I’ve heard similar tales from other gardeners. The big thing with Warrigal Greens is that you need to BLANCH THEM FIRST before using, due to their Oxalic acid content. Drop them into boiling water for no more than one minute, then drain, squeeze out excess water, and you’re ready to go. 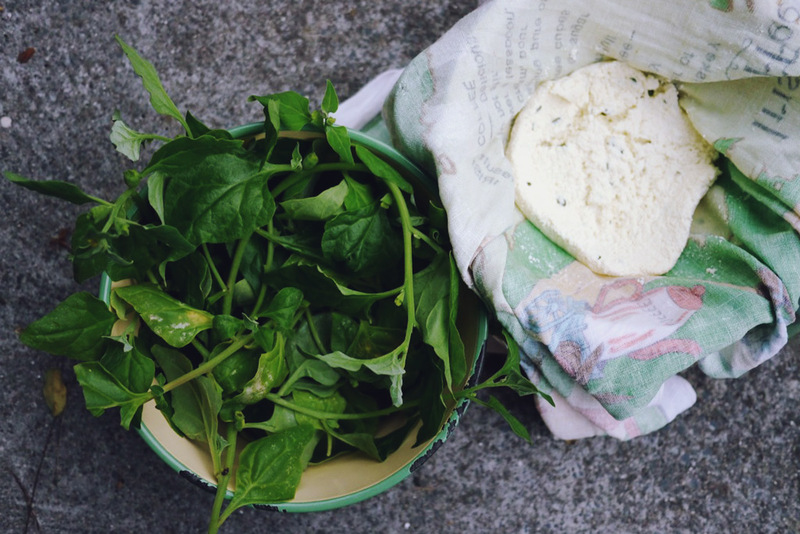 Our favourite way is to chop them up and use in pastitzis or cannelloni (with home-made ricotta, which is ridiculously easy to make, by the way). But you can also use them however you might use green things – in pesto, dumplings, pasta, fritters or whatever gets you going. In the past few years Warrigal Greens seem to be on the Sydney restaurant circuit – showing up at places like Billy Kwongs and Momofuku Seiobo, to name just a few. There’s loads of recipes out there too, including Warrigal Greens pesto and frittatita or, if you’re feeling fancy, suckling pig with roast fennel and warrigal greens. Haven’t tried making a saag with it yet, but I rekon that would rock too. 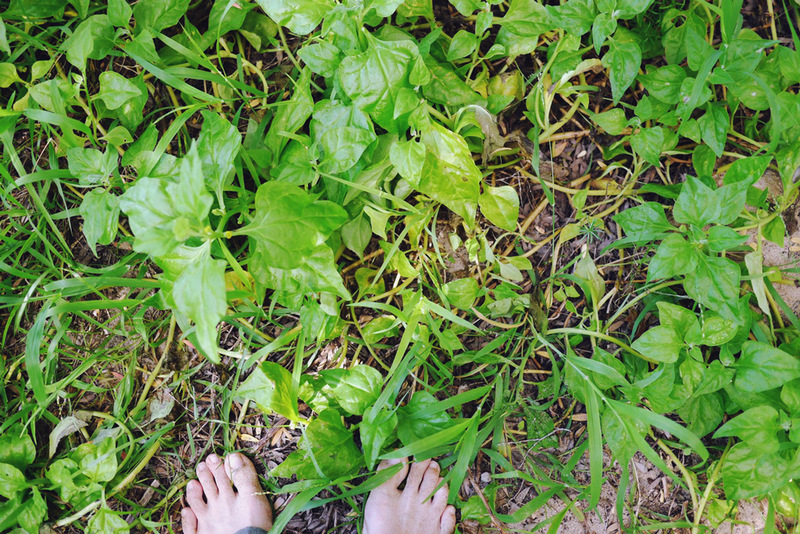 Do you forage or grow Warrigal Greens? What do you do with yours? Here's how we made some quick garden beds from scrap timber with . .
That actually looks very tasty, with a little olive oil and some red wine vinegar. Just to let you know that over here in Belgium, it is named “New Zealand Spinach”. I have been wondering why it is so difficult – sometimes – to make them sprout – and when you replant them, to make them ‘take on’… other years your whole garden bed is full of them! I think it’s called NZ Spinach pretty much everywhere except Australia where it’s Warrigal Greens. Found once you have a cutting take off you always have them. Thank you for using the Latin names too. So many plant have many common names. Inspiring and such varied content. Wish you were closer. This is one of the big successes in our community garden. I often use it to bulk out other recipes or just add another element of nutrition (e.g. in a lentil soup). And you’re so right about blanching- I made that mistake once, never again! Just to reiterate and a word of warning if you are taking up eating Warrigal Greens for the first time make sure you blanch the leaves. 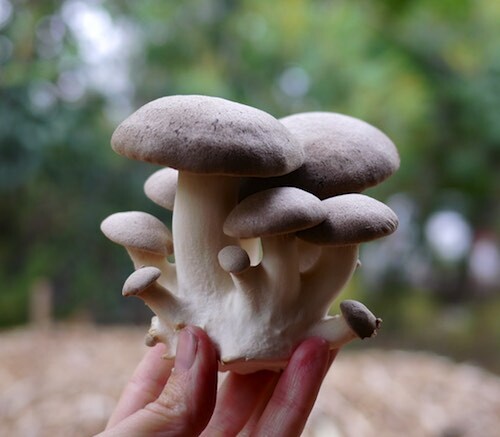 This plant can produce concentrations of oxalates, nitrates and saponins. These can all upset ones health or even cause serious concerns. Eating the very youngest of shoots will avoid the concentrated areas of older leaves. So it is best to blanch the leaves and discard the water disposing of many of the concentrates at the same time. Saponins are a type of glycoside which may cause gastric irriations. Oxalates form calcium oxalate crystals, which can cause kidney damage. Nitrates are usually reduced to nitrites which oxidize heamoglobin leading to vasodilation and decreased blood pressure. 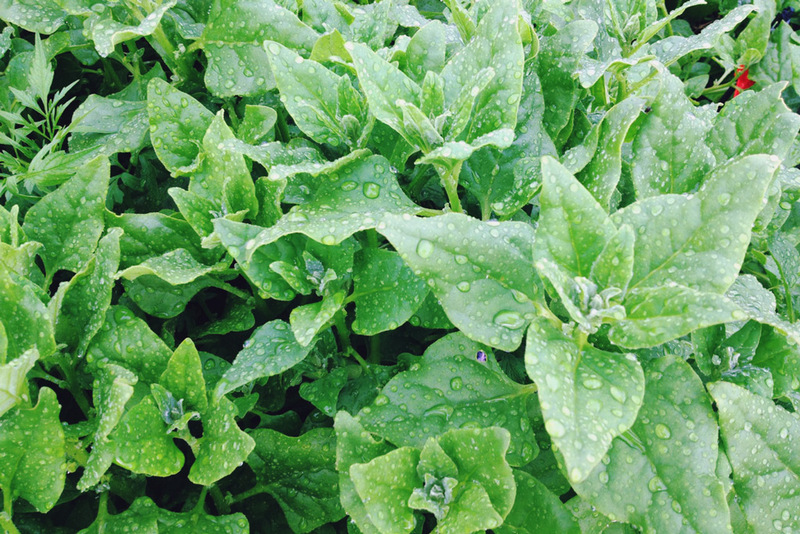 When my brother (French) saw my Warrigal Greens, he flatly said “oh! la tetragone! It comes from Europe”… I was so glad years later to inform him that it was native to Australia and had been brought back to Europe… Reverse colonisation!!! Just a hint on the propagation side of things…Don’t be afraid to soak the seeds and change the water. In fact, I wouldn’t sow the floaters and would wait for them to sink. A lot of the plants (Chenopods especially) that grow in periodically dry areas will germinate much more consistently (rather than sporadically) once they’ve had a good flush (= a decent fall of rain). Cheers, Alex. I grew from seed and once established, it self seeds here in SE Qld. and you will have it forever. The seed blow in the wind and warrigal greens pop up throughout the garden. I’ve been reluctant to eat them due to 2 warnings on ABC Gardening. Hmm. Haven’t seen those precise warnings but if you cook it properly, it’s darn tasty. Given how many chefs are using it now, I am not sure that the ABC Gardening info may be current?